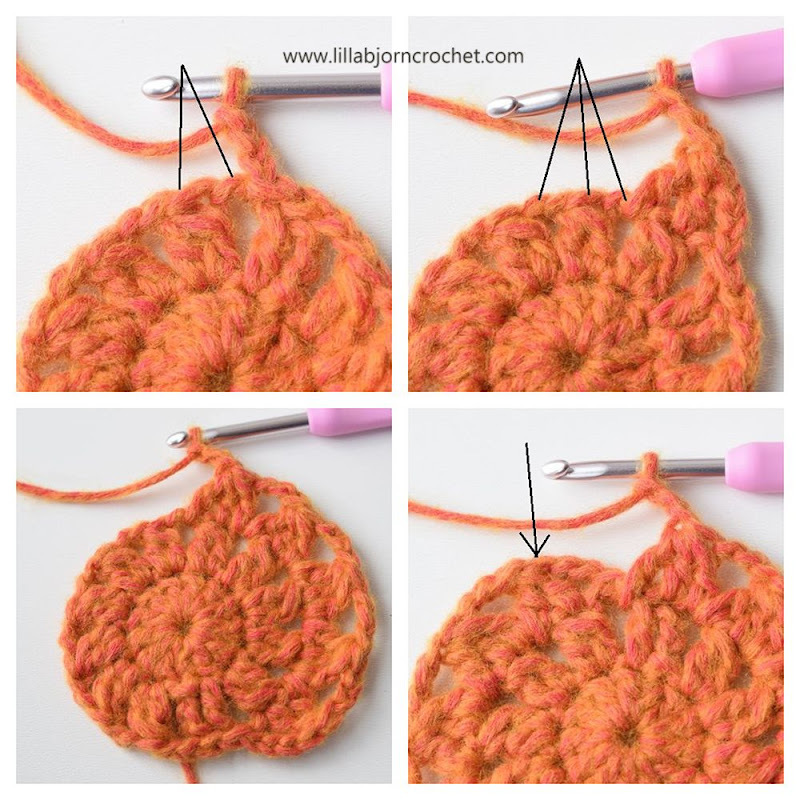 dc (doble crochet) – insert hook in indicated stitch, yo, draw up a lp, yo and pull through both lps on hook. htr (half treble crochet) – yo, insert hook in indicated st, yo, draw up a lp, yo, pull through all three lps. 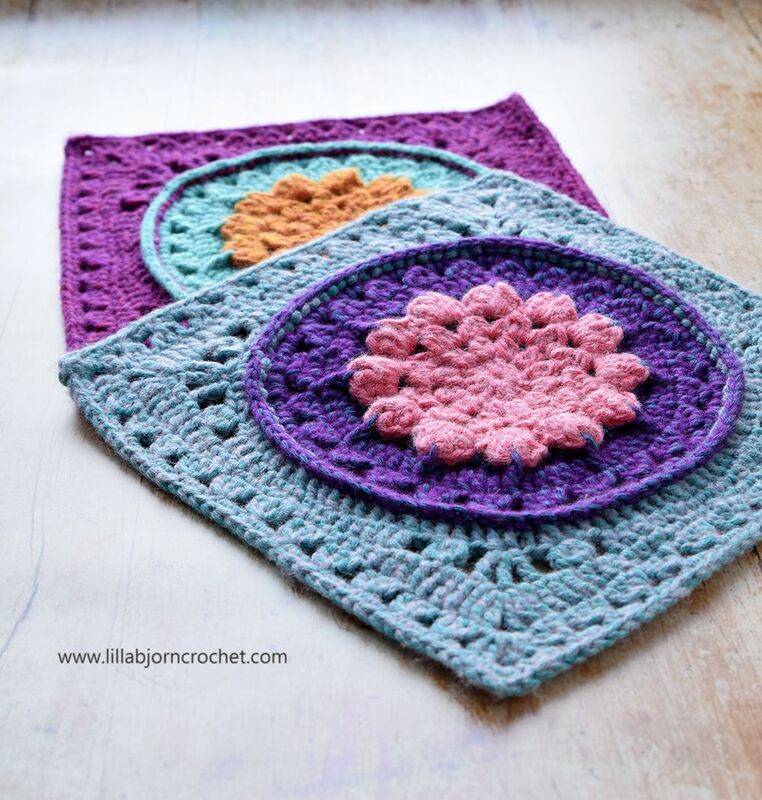 dtr ( double treble crochet) – yo twice, insert hook in indicated st, yo, draw up a lp, *yo, pull through 2 lps* three times. 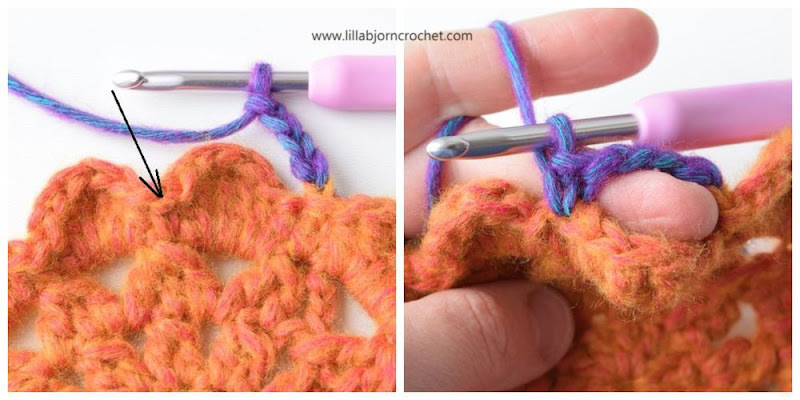 tr2tog (treble crochet 2 together) – *yo, insert hook in indicated st, yo, draw up a lp, yo, pull through 2 lps; repeat from * once more, yo, pull through all 3 lps on hook. 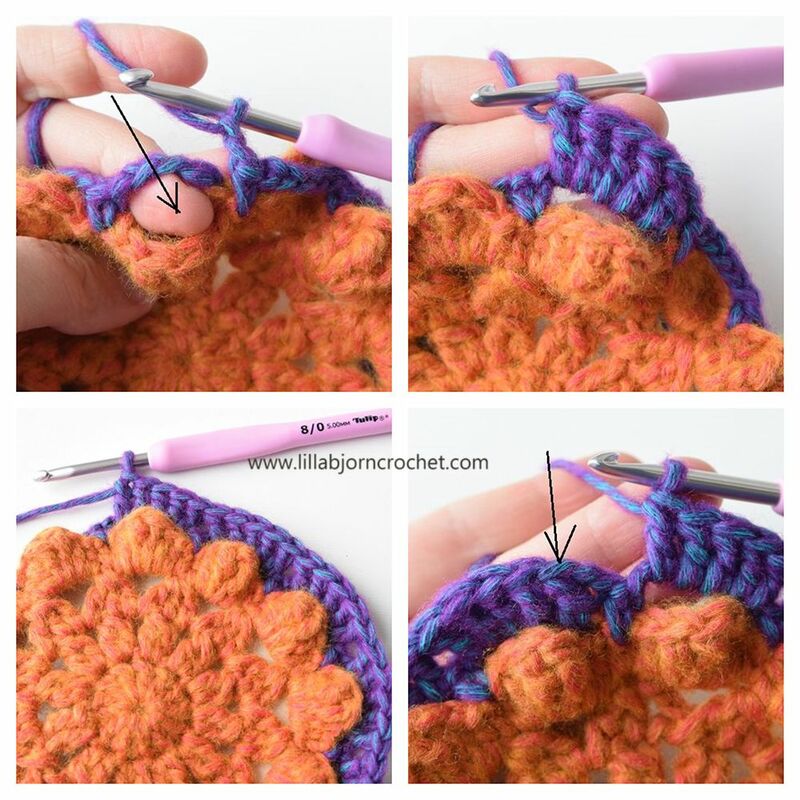 tr3tog (treble crochet 3 together) – *yo, insert hook in indicated st, yo, draw up a lp, yo, pull through 2 lps; repeat from * twice more yo, pull through all 4 lps on hook. 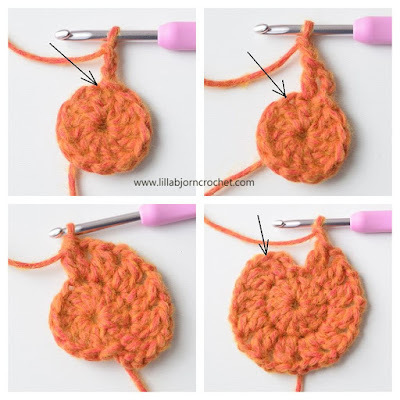 tr4tog (treble crochet 4 together) – *yo, insert hook in indicated st, yo, draw up a lp, yo, pull through 2 lps; repeat from * 3 more times in same stitch, yo, pull through all 5 lps on hook. 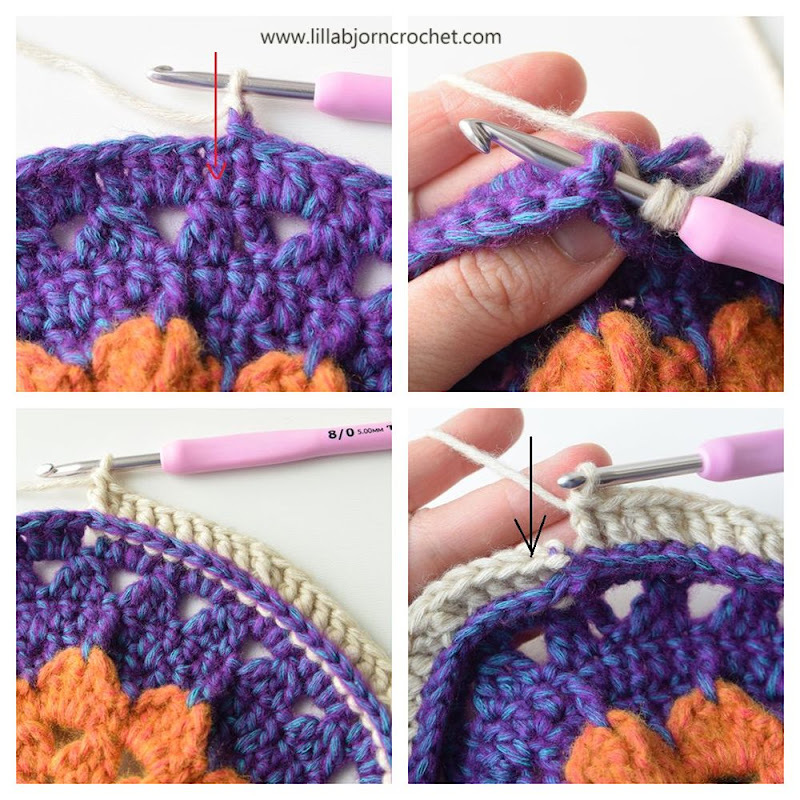 BPtr (back post treble crochet) – yo, insert hook from back to front to back around the post of indicated stitch, yo, draw up a lp, *yo, pull through 2 lps; repeat from * once more. Round 1. With Yarn A make magic ring, ch2 (doesn’t count as a st), 12tr in ring, tighten ring, join with ss in first tr after ch2 – 12 tr. Round 2. Ch3 and tr in the same st as join (counts as first tr2tog), ch2, *tr2tog in next st, ch2* 11 times, join with ss in first tr after ch3 – 12 tr2tog, 12 ch2-sps. Round 3. First leg of first tr3tog will be ch3. Ss in next ch2-sp, *tr3tog (over same sp, next tr2tog and next sp), ch3* 12 times, join with ss in first tr3tog – 12 tr3tog, 12 ch3-sps. Round 4. Ch1 (doesn’t count as a st), *dc in tr3tog, (htr, tr, 2dtr, tr, htr) in next ch3-sp - petal made* 12 times, join with ss in first dc – 12 “petals”. 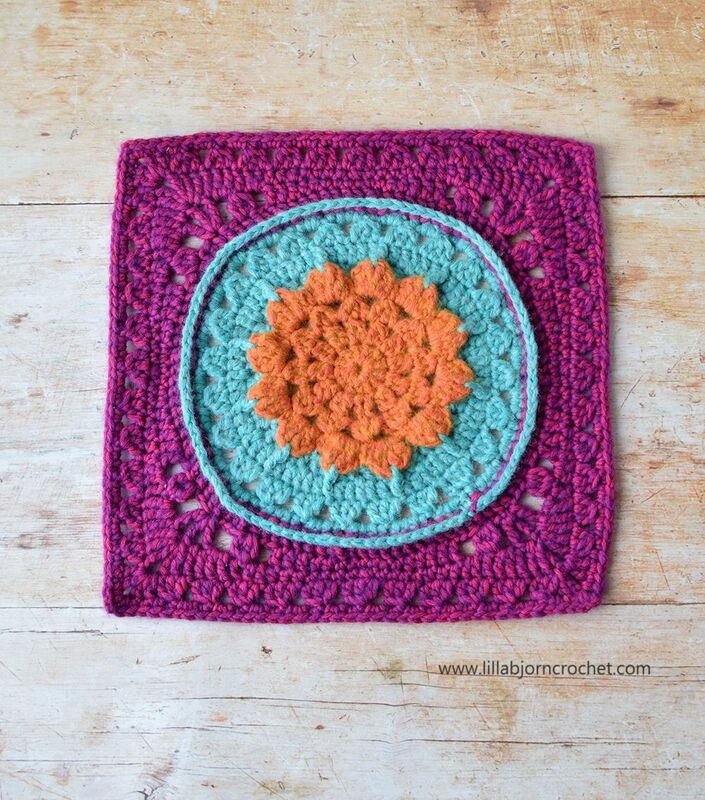 Cut yarn if changing colour. *Ch5, skip petal, dc in next dc* 12 times. Make last dc over joining ss of the previous round – 12 dc, 12 ch5-sps. Round 6. Ch2 (doesn’t count as a st), *5tr in next ch5-sp* 12 times, join with ss in first tr after ch2 – 60 tr. Round 7. First tr is made in same st as join. Ch2 (doesn’t count as a st), *2tr, dtr in sp between 2dtr of the petal below, skip 1 st on Round 6, 2tr, tr between current and next tr of Round 6* 12 times, join with ss in first tr after ch2 – 60 tr, 12 dtr. Round 8. First leg of first tr3tog will be ch3. *Tr3tog over next 3 sts, ch3* 24 times, join with ss in first tr3tog – 24 tr3tog, 24 ch3-sps. Round 9. First tr is made in same st as join. Ch2 (doesn’t count as a st), *tr in tr3tog, 3tr in next сh3-sp* 24 times, join with ss in first tr after ch2 – 96 tr. Fasten off if changing colour. Round 10. 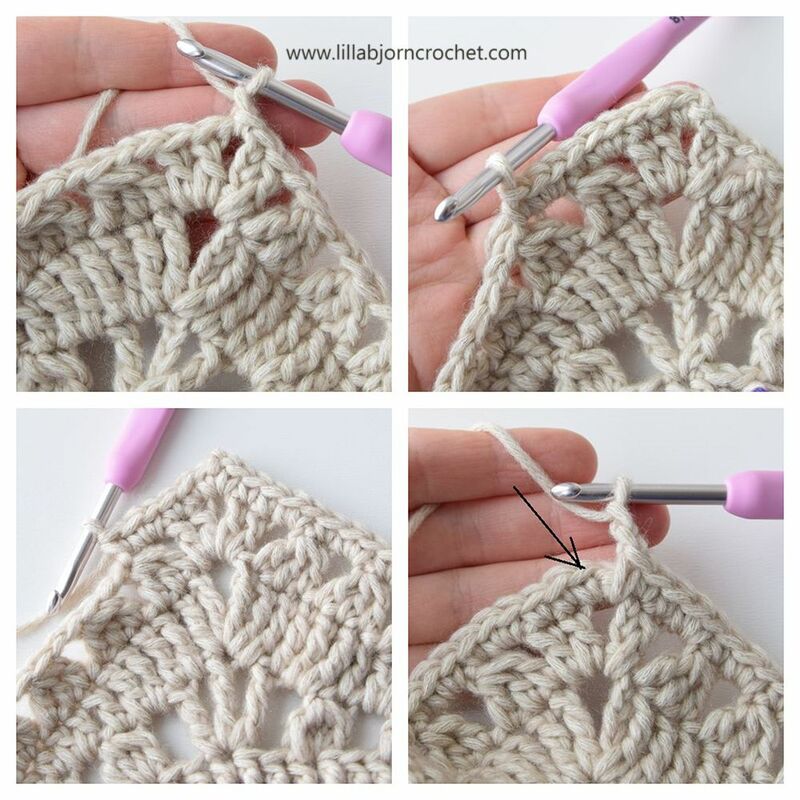 Continue with Yarn A or change to Yarn C in first ch1. First BPtr is made around first tr of previous round (after ch2). Ch2 (doesn’t count as a st), *BPtr around each of next 4 sts, 2BPtr around next st, BPtr around each of next 3 sts* 12 times, join with ss in first BPtr after ch2 – 108 BPtr. Ss in each of next 2 sts, *dtr in same st, ch1, dtr in same st, ch2, skip 2 sts, tr4tog in next st, ch2, skip 2 sts, 2tr, 3htr, 6dc, 3htr, 2tr, ch2, skip 2 sts, tr4tog in next st, ch2, skip 2 sts, dtr in next st, ch1* 4 times working last dtr in the same st as the first dtr, join with ss in fourth ch in the beginning of the round – 2 dtr, 2 tr4tog, 4 tr, 6 htr, 6dc, 4 ch2-sps and 2 ch1-sps on each side, dtr in each corner. *Dtr in same dtr, ch2, 2dtr in same dtr, dtr in next ch1-sp, dtr in next dtr, 2dtr in next ch2-sp, tr in next tr4tog, 2tr in next ch2-sp, htr in each of next 3 sts, 4dc, dc2tog over next 2 sts, 4dc, htr in each of next 3 sts, 2tr in next ch2-sp, tr in next tr4tog, 2dtr in next ch2-sp, dtr in next dtr, dtr in next ch1-sp, dtr in next dtr* 4 times making last dtr in the same st as the first dtr, join with ss in fourth ch in the beginning of the round – 12 dtr, 6 tr, 6 htr, 8 dc and dc2tog on each side, ch2-sp in each corner. Ss in sp, *tr in same sp, ch2, 2tr in same sp, (ch2, tr3tog over next 3 sts) x11 times, ch2, tr in next sp* 4 times making last tr in the same sp as the first tr, join with ss in third ch in the beginning of the round – 4 tr, 11 tr3tog and 12 ch2-sps on each side, ch2-sp in each corner. Round 14. Ss in sp, ch1 (doesn’t count as a st), *dc in same ch2-sp in the corner, dc in each of next 2 sts, (2dc in next sp, dc in next tr3tog) x 11 times, 2dc in next sp, dc in each of next 2 sts, dc in next ch2-sp in the corner, ch2* 4 times making last dc in the same sp as the first dc, join with ss in first dc, fasten off – 41 dc on each side, ch2-sp in each corner.